Proehl was right, of course. A dynasty was born that night — just not the one he was imagining. Tom Brady and the New England Patriots ended up toppling the heavily favored Rams in Super Bowl XXXVI, using it as a springboard for the greatest run of sustained success any NFL team has ever known. The Patriots were the up-and-coming team back then, while the Rams were the established champions with the veteran, future Hall of Fame quarterback. This time around, though, the roles will be reversed for the two franchises — with the Patriots serving as the elder statesmen, while the Rams are the team on the rise. It’s a fitting turnabout, one featuring what the Elias Sports Bureau determined was the largest gap in age between both starting quarterbacks (Tom Brady is 17 years and 72 days older than Jared Goff) and head coaches (Bill Belichick is 33 years and 283 days older than Sean McVay) in Super Bowl history. OK, Elo — who ya got in the Super Bowl? Elo quarterback adjustments are relative to average, based on a rolling average of defense-adjusted QB stats (including rushing). The Patriots still somehow have two very important components from that original Super Bowl against the Rams: Brady and Belichick. At age 41, Brady had his worst passing numbers in several years, yet he also was still a top-10 QB (at worst), a Pro Bowler and — it bears emphasizing — impossibly productive for his age. All of that came despite throwing to a revolving-door cast of receivers and a less-dominant version of longtime security blanket Rob Gronkowski. All told, Brady led an offense that still ranked fourth in scoring and eighth in expected points added, albeit with a lower per-game EPA average than any Pats team with Brady as starter since 2013. For Belichick’s part, this season saw his Patriots improve significantly on defense, jumping from 24th in EPA in 2017 to seventh in 2018. Although New England tied for the second-fewest sacks in the league, it generated the third-most pressure (according to ESPN’s Stats & Information Group), forced the second-lowest completion percentage and generally was the best Patriots pass defense in a while. And this team was also a celebration of Belichick the (de facto) general manager: In addition to shrewd veteran acquisitions such as CB Stephon Gilmore and LB Kyle Van Noy, a large share of the Pats’ production came from draft picks made over the past few years, including DLs Trey Flowers and Malcom Brown, OLs Shaq Mason and Joe Thuney, and rookie RB Sony Michel.1 All of those pickups helped fuel a Pats roster that still relied heavily on Brady to work his magic but also blocked well and played sound defense. The Patriots’ run wasn’t always easy, of course. The 2018 edition had the second-worst points per game differential and lowest Elo rating of the franchise’s Super Bowl-bound squads since … you guessed it, the 2001 team. But maybe that’s just further proof that everything truly has come full circle in New England. They’re certainly hoping the story ends the same way this time around. As for these current Rams, they are not too dissimilar from their Greatest Show on Turf forebears, either. Los Angeles outscored opponents by 143 total points in the regular season (third-best in football) and got high marks in every power ranking out there, including Elo (which ranks them No. 2), Football Outsiders’ Defense-adjusted Value Over Average (No. 2), ProFootballFocus’s rankings (No. 2), Jeff Sagarin’s ratings (No. 2), Andy Dolphin’s predictive rating (No. 3) and Pro-Football-Reference.com’s Simple Rating System (No. 3). 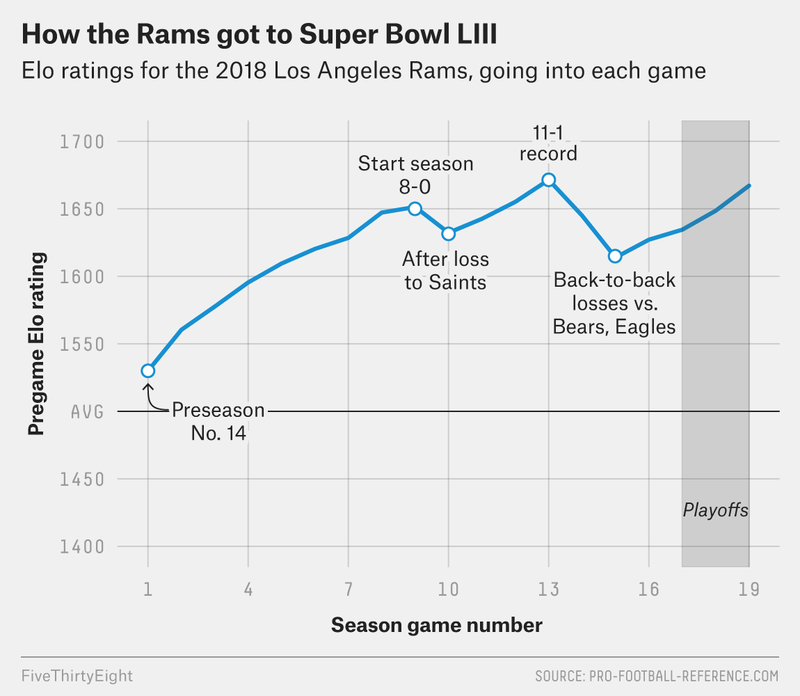 Though they never actually ranked first in Elo at any point during the season, the Rams were consistently one of the game’s top contenders all year long. And they got that way just about as quickly as those fabled 1999 Rams, who went 4-12 the year before Kurt Warner and Marshall Faulk changed the franchise’s fortunes forever. The 2018 season culminated a remarkable two-year turnaround arc under soon-to-be-33-year-old coach Sean McVay, who took L.A. from a 4-12 disaster in 2016 under former coach Jeff Fisher to an 11-5 record last year, and now a Super Bowl. Over that span, the Rams went from an Elo rating of 1346 to 1667, a gain of 321 Elo points. Only four other Super Bowl teams in history have gained more rating points from the end of two seasons prior to the start of the big game itself — the 1998 Atlanta Falcons (+368), 1981 San Francisco 49ers (+360), 1992 Dallas Cowboys (+357) and 1971 Miami Dolphins (+339). Even the ’99 Rams had “only” gained 246 points of Elo from the end of 1997, though they do own the largest single-season gain ever for a Super Bowl team. How did L.A. do it? The cornerstones of the 2018 team — Goff, DT Aaron Donald and RB Todd Gurley2 — were all drafted by the club from 2014 to 2016. But general manager Les Snead did his best work over the 2017 and 2018 offseasons, snagging the majority of the current team’s other starters either via the draft or in a flurry of win-now moves that mostly look smart in hindsight. The other key ingredient was coaching, where (with a few weird exceptions on Sunday) McVay has shown a fantastic knack for incorporating analytical thinking into his play-calling, and he remains the master of keeping defenses off-balance by running almost all of his plays out of the same personnel package. While there are very legitimate questions as to whether Goff or Gurley could be as successful in a different system, the pair has powered a Super Bowl run under McVay’s scheme. Each team needed luck to get here, too. The Rams likely wouldn’t be headed to Atlanta without a blown pass-interference call that kept New Orleans from running down most of the clock in regulation, instead giving L.A. the chance to force overtime and eventually win the game. The Patriots benefited from a phantom roughing-the-passer penalty and a (legitimate) offside call that negated what would have been a game-ending interception, then rattled off what felt like a million straight third-and-long conversions in overtime. 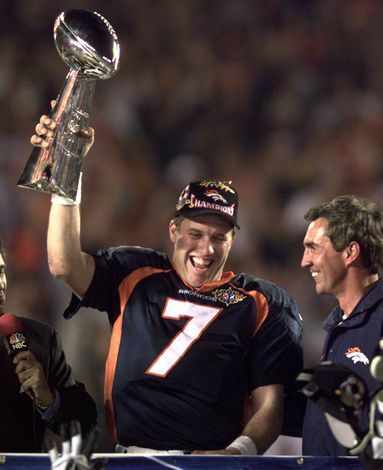 But there isn’t a single Super Bowl team in history that didn’t have big moments when fortune smiled on it. You have to be lucky and good to win a championship, and these teams fit both criteria. Now, they’ll get a chance to battle on the game’s biggest stage. Will a new dynasty be born? Or will an old one keep rolling? Will the new Greatest Show on Turf avenge the old one? Or will Belichick draw up another brilliant game plan to shut down this latest version? Either way, it should be a fitting way to end one of the most entertaining NFL seasons in a while. 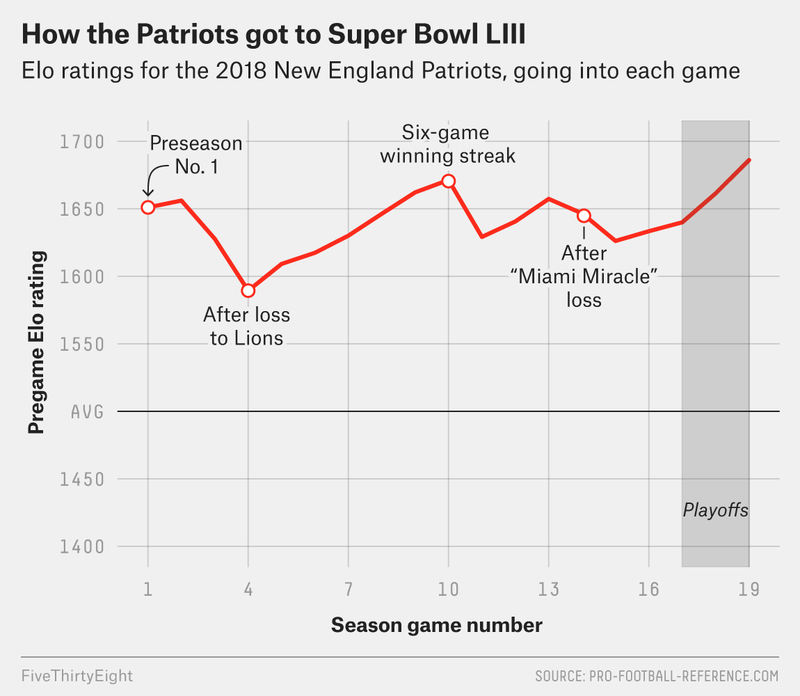 As you prepare for the Super Bowl, be sure to check out FiveThirtyEight’s NFL predictions page, which uses our Elo ratings to simulate the game 100,000 times, tracking how likely each team is to win. You can also make your Super Bowl pick against the Elo algorithm in our prediction game and make one last bid to climb up our giant leaderboard. Congratulations are in order to reader Deryl Mundell, who leapfrogged long-standing leaderboard-toppers Neil Mehta and Greg Chili Van Hollebeke to claim first place on the season, checking in with 1,202.5 points. Deryl is also our No. 1 (identified) player on the postseason, with 294.2 points since the playoffs started. Thanks to everyone who has been playing — and the game isn’t over yet! You now have one last chance to make your Super Bowl pick. Make it count! Because of this logjam of good-not-great teams, nobody heads into the playoffs with better odds than the New Orleans Saints’ 21 percent chance to win it all, according to Elo. That’s the third-lowest pre-playoff championship probability for a Super Bowl favorite since 1990, trailing only the 2015 Carolina Panthers and 2009 San Diego Chargers at 20 percent apiece. It’s also much lower than the 30 percent average for the typical pre-playoff favorite before this year. Overall, this year’s favorites are less likely to win the Super Bowl than usual — meaning the Saints and Kansas City Chiefs have a lower probability than the typical top two going into the playoffs — while most of the lesser teams have a better chance than you’d expect to see in an average year. All numbers are as of the final regular-season game of a given year. 2018 probabilities may not add up exactly to 100 percent because of rounding. Given all of this, the wild-card round could take on more significance than usual, since it’s not a stretch to imagine one of the teams playing this weekend taking home the Lombardi Trophy when all is said and done. If Elo had to pick a favorite from that category, it would be the Chicago Bears, who are currently tied for third in the league in Elo and will host the defending Super Bowl champion Philadelphia Eagles (tied for No. 7) on Sunday at 4:40 p.m. ET. Chicago finished the regular season having allowed the league’s fewest points, so this is a classic Monsters-of-the-Midway Bears team in that sense. But quarterback Mitchell Trubisky is also playing much better than the typical Chicago QB from playoffs past — he’s no Jim Miller or Rex Grossman, for instance. According to ESPN’s Total Quarterback Rating,5 Trubisky was the NFL’s third most effective quarterback on a per-play basis this season. While he had some lows (such as a dreadful 29.5 QBR in an opening-week loss to the Packers) to go with the highs (like a 98.9 QBR vs. Tampa Bay in Week 4, one of the highest single-game marks on record), Trubisky’s strides as a second-year passer helped Chicago’s offense — which ranked a respectable 13th in expected points added — be more in line with its dominating defense. Everyone else is somewhere in between, including the resurgent Eagles with backup Nick Foles, whose QB adjustment is back roughly where it was after Philly beat the Patriots in the Super Bowl, but took many twists and turns to get there; the Chargers with 37-year-old Philip Rivers, whose own adjustment has fallen by 38 Elo points since Week 13 with a string of mediocre outings down the stretch; the Dak Prescott-led Cowboys, whose team QB adjustment has hovered around average all season; and Russell Wilson’s Seahawks, whose own run-heavy attack masked another season of highly efficient passing. 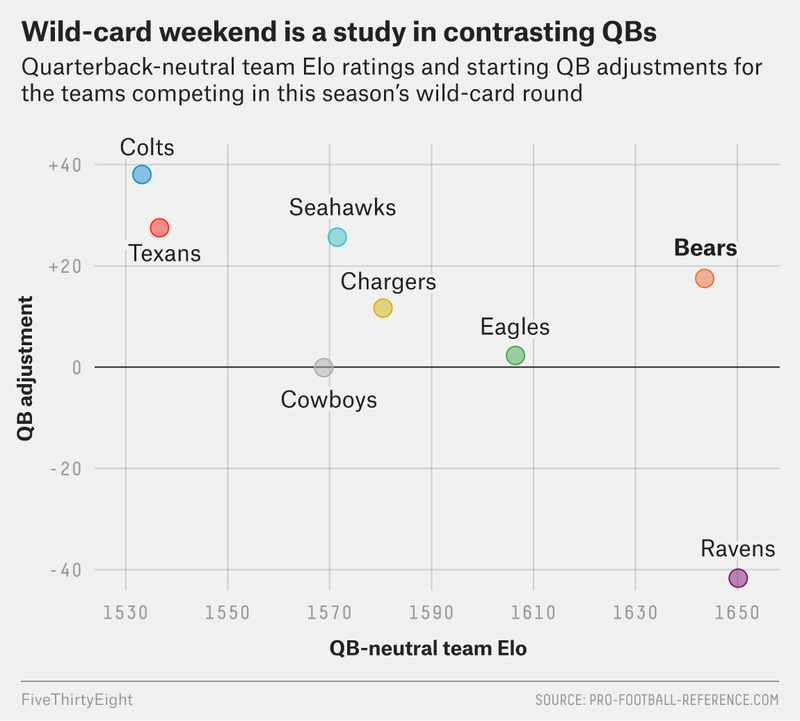 Of those, Elo gives the best chance of advancing to the Bears, followed by the Ravens. And upset-wise, the best odds belong to the Seahawks against the Cowboys, regardless of whether we adjust for recent QB performance. Whichever teams win, they’ll have to contend with road games in the divisional round — but given the overall state of the league, they’ll still have a better chance than usual to knock somebody off and forge their own path to the Super Bowl. To keep tabs on each team’s classic Elo as the weekend plays out, be sure to check out FiveThirtyEight’s NFL prediction interactive, which simulates the rest of the season 100,000 times and tracks how likely every team is to advance through the playoffs and win the Super Bowl. And even though the regular season is over, you can still pick against the Elo algorithm in our prediction game and keep climbing up our giant leaderboard. Either way, congrats to Jake Horowitz, who led all identified users in Week 17 with 294.2 points, and to good ol’ Greg Chili Van Hollebeke, who hung on to his No. 1 ranking for the season with 1,168.1 points. Thanks to everyone who has been playing — and the game isn’t over yet! You should keep making picks and trying your luck against Elo throughout the playoffs. Did The Packers Squander Aaron Rodgers? The dismissal of Green Bay coach Mike McCarthy — who was let go after the Packers’ stunning home loss to the Arizona Cardinals on Sunday — wasn’t exactly a shock. Perennially tabbed as a Super Bowl contender out of the NFC, McCarthy’s team had gone just 11-16-1 over the past two seasons, including a disappointing 8-9-1 in games that featured future Hall of Fame quarterback Aaron Rodgers as Green Bay’s primary passer.1 It was time for a change along the sidelines that Vince Lombardi once roamed. Things weren’t always so bleak on the frozen tundra. The McCarthy era had its high points, particularly early on — when he and Rodgers appeared to have Green Bay positioned on the cusp of a potential dynasty. But between postseason near-misses, roster changes, injuries and coaching miscues, McCarthy’s Packers never fulfilled that promise. Instead, it’s fair to wonder whether Green Bay squandered the prime of one of the most talented QBs in NFL history. The Packers team that McCarthy inherited in 2006 from Mike Sherman2 was one in transition — and that meant navigating some heavy-duty Brett Favre melodrama in his first two seasons at Green Bay’s helm. However, McCarthy quickly found that he had an all-time great on his hands in Rodgers, who, when he took over the starting job at age 25, was just entering his best years as a passer. The McCarthy-Rodgers marriage sputtered to a 6-10 finish in its first season but yielded great results shortly thereafter: an 11-5 playoff campaign in Year 2, then a Super Bowl crown in Year 3 and a 15-1 regular season (with Rodgers winning MVP) in Year 4. The sky seemed to be the limit for McCarthy and his star QB. Since the end of the 2011 regular season, however, the Packers have gone just 5-6 in the playoffs; by comparison, Tom Brady and the postseason Patriots are 13-5 over the same span. Green Bay’s record includes a crushing home defeat against the New York Giants two weeks after that 15-1 season ended and another loss in which they watched helplessly as ex-49er Colin Kaepernick destroyed their defense in 2012 — still one of the greatest individual QB games in playoff history. The Packers’ postseason circumstances have not always been ideal: For instance, that Giants game was actually the only time since 2011 that Green Bay lost in the playoffs while favored — meaning the rest of the losses were as underdogs. But at the same time, the Pack have also had clear chances to return to the Super Bowl, and they came up short in each of them. 1990 was the first season of the NFL’s current playoff format. Expected Super Bowls are based on a season-by-season logit regression between a QB’s Yards Above Backup and whether his team made the Super Bowl. Over time, it became more and more difficult for the Packers to come within striking distance of the Super Bowl. In 2015, Rodgers slumped to career-worst numbers without top wideout Jordy Nelson, though the team as a whole was still good enough to get to the divisional playoffs before losing. In 2016, it was more of the same when Rodgers mused that Green Bay could still “run the table” — sparking an eight-game winning streak that saw the QB return to vintage form and left the Packers a win away from the Super Bowl.4 By then Rodgers was 34 years old, so a sense of urgency was setting in when 2017 came and went without a playoff berth — even though that could be written off as the byproduct of Rodgers missing nine starts. The 2018 season was always going to be the real crossroads for McCarthy. With a healthy Rodgers leading the way, the Pack could always count on contending in the past, so this year’s expectations were no different. But Rodgers’s numbers have been merely good, not great. Brett Hundley isn’t around anymore to take any blame. And unlike in 2015, when Green Bay was talented enough to survive despite a downturn in its QB’s individual stats, there has been no answer from the team’s supporting cast this time around. It all came crashing down around McCarthy in the loss to Arizona as 13½-point favorites, Green Bay’s single most disappointing defeat since the merger according to Pro-Football-Reference’s point-spread data. At the beginning of 2015, the Packers had an effective Elo of 1622, which included a 73-point boost from having Rodgers at QB and a 49-point boost from his teammates. 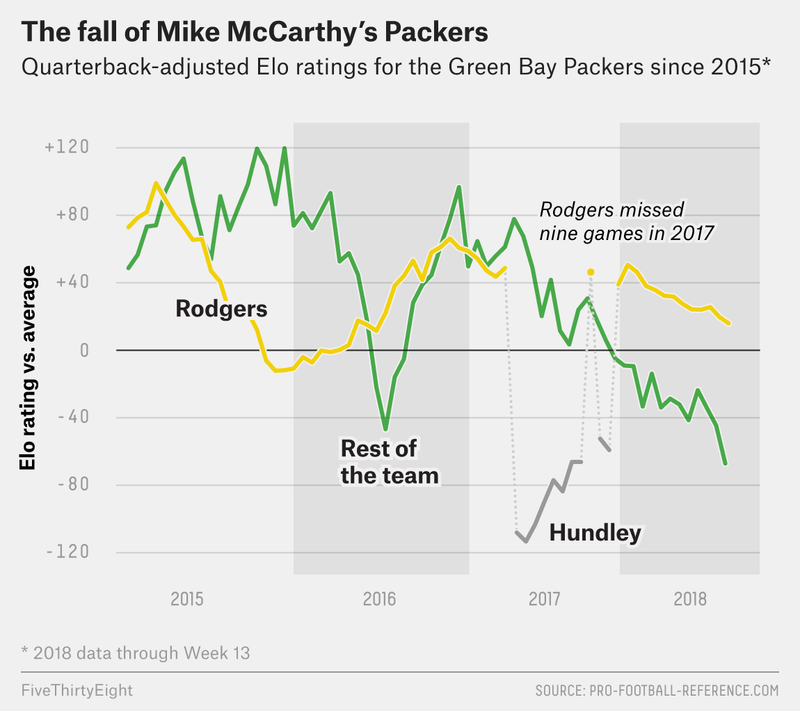 By the end of the year, Green Bay’s effective Elo was still in the same neighborhood (1597), despite Rodgers’s adjustment actually dropping to negative 11, because the rest of the team carried a larger share of the weight (+108). Meanwhile, at the peak of the Packers’ run-the-table surge in 2016, the team’s 1657 effective Elo arose out of a 61-point boost from Rodgers and 97 additional points (relative to league average) from the rest of the team. But fast-forward to now, and it’s clear how much the Packers have crumbled around Rodgers. His own adjustment is 16 points of Elo above an average QB, the lowest it’s been since Week 10 of the 2016 season. But he’s still expected to be above average; his supporting cast, by contrast, has fallen to a negative-67 score relative to the average team. That’s the worst they have been in Rodgers’s entire NFL career, and it isn’t especially close. Keeping QB play constant, the Packers’ Elo has dropped by a total of 139 points since the end of the 2016 season, which is essentially the difference in current Elo ratings of the 11-1 Los Angeles Rams and the 6-6 Carolina Panthers. The reasons for the slide are varied, but many can be traced back to a series of poor drafts under former general manager Ted Thompson, who was replaced by current front-office chief Brian Gutekunst in January. As Sports Illustrated’s Kalyn Kahler pointed out last week, only three of Green Bay’s 17 draftees from 2014 and 2015 remain on the current roster. While no team can avoid dry spells in the NFL draft if given enough time, the Packers also — largely by design — did little in the way of enlisting outside help as a backup plan.6 Combine those infrastructural problems with criticisms of McCarthy’s offensive scheme (criticisms of a perceived lack of innovation that Rodgers apparently shared), plus legitimate complaints about Rodgers’s own decline in performance, and a season like this was bound to happen to Green Bay sooner or later. Although the Packers hadn’t replaced a coach at midseason since 1953, Sunday’s loss forced their hand. Now they’ll need to figure out who’s next, from a candidate list that includes big names among both pro coordinators (Josh McDaniels) and up-and-coming college coaches (Lincoln Riley). They’ll also need to hope Rodgers’s issues were more related to McCarthy’s offense and less to his getting older and less productive — basically, that the next Packer coach will be more Mike Shanahan to Rodgers’s John Elway than Jimmy Johnson to his Dan Marino. So while the Packers may not have much on the line over the rest of their games, this promises to be the most interesting offseason Green Bay has had since Favre was retiring and unretiring more than a decade ago. Make sure to check out FiveThirtyEight’s Elo ratings using our NFL prediction interactive, which simulates the rest of the season 100,000 times and tracks how often each team should make the playoffs and win the Super Bowl. And did you know you can also pick against the Elo algorithm in our prediction game? Maybe you can also climb up our giant leaderboard (or, if you’re like me, fall down it with each passing week). After a series of narrow wins at midseason, the algorithm handed the readers their worst loss (-55.2 points on average) since Week 3. Some of the blame can go to the subject of this column — the Green Bay Packers, whose loss not only cost Mike McCarthy his job but also cost users 10.5 points on average. But readers were also burned by the Jaguars’ win over the Colts and the Cowboys’ upset victory over the Saints. Add it up, and Elo has beaten the average reader 12 times in 13 weeks this season. But congrats to Mike Edelstein, who led all users in Week 13 with 137.0 points, and to one of my favorite leaderboard names, Greg Chili Van Hollebeke, who maintained his No. 1 ranking on the season with 1,002.1 points. Thanks to everyone who has been playing — and if you haven’t, be sure to get in on the action! You can make picks now and still try your luck against Elo, even if you haven’t played yet. Here’s a surprise: The New England Patriots are 8-3, leading the AFC East, with some of the best odds in the conference of winning the Super Bowl. Oh, right. I’ve just described basically every Pats season in recent memory. This is the ninth consecutive season that New England has won at least eight of its first 11 games. The team’s current Elo rating of 1641, however, is the lowest it’s been through the same stage of the season since 2009 (and we don’t talk about that season). So what are we to make of these Patriots, then? After overcoming the typical early season hiccups, is this year’s version ready to build championship momentum down the stretch like normal? Or is there still something a little bit off about a team that was showering its punter (of all players) with praise after an uncharacteristically modest win over the lowly New York Jets last week? In advance of New England’s showdown Sunday against the Minnesota Vikings, let’s take a look at some of the Patriots’ calling-card metrics to see whether this season is business as usual in Foxboro. This year, though, New England is a perfect 5-0 at home but only 3-3 on the road — respectable but nowhere near the league’s best. (The Pats have also been outscored by 11 points in away games, against a road schedule that ranks just 28th in average opposing Elo.) And this might come up in the playoffs, unlike so many seasons in which the Pats had home-field advantage through the AFC title game.1 Right now, New England is in line for the AFC’s No. 2 seed behind the Kansas City Chiefs, but only a half-game separates them from the fourth-seeded Steelers. Turnover margin is one of the most important factors in determining who wins or loses any football game. Conventional stathead wisdom, though, tells us that outlier turnover seasons — whether avoiding them on offense, forcing them on defense, or both — are unsustainable. While there are some ways a team can influence its tendency to have more takeaways than giveaways, a lot of it also comes down to luck. Unless, of course, you’re the Patriots. New England perennially dominates this category, ranking first by a mile from 2010 through 2017 with a +116 turnover differential, almost double that of the next-best team. A lot of that is a function of having Tom Brady at QB; he’s tied for the second-lowest interception percentage of any passer in NFL history. But the Pats are also great at avoiding fumbles — only the Falcons had coughed it up fewer times since 2010, and no team had lost fewer fumbles than the Pats. And their defense had forced the second-most turnovers of any team this decade (behind the Giants), ranking second in interceptions and tied for third in fumbles recovered. Such opportunism has historically paid big dividends for New England, but this year’s squad is still trying to recapture that formula. The Pats are currently +5 in turnovers, which ranks ninth in the league but is nothing special by their standards. Brady has his highest interception rate since 2013 (his seven picks already are only one off of his full-season total from last year), driving a big overall increase in giveaways per game, though the team is being more careful in recent weeks. And while the Pats have forced at least one turnover in all but one game this season, they are tied for eighth-to-last in the league in games with three or more takeaways, six behind the league-leading Bears. 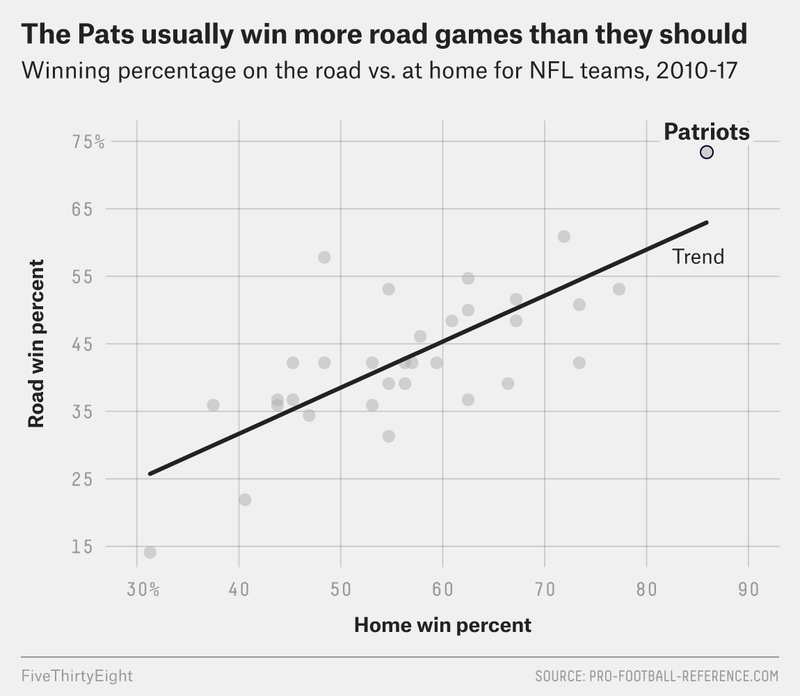 In addition to — and correlated with — their dominant turnover differential, the Patriots have always had another trick up their sleeves in terms of winning extra games. It involves their yards per point (YPP): essentially, how efficiently they turn field position into scores on offense and how inefficiently they force opponents to do the same. By definition, when you have a lower YPP than the opponent, you will win more often because you’re trading field position for points at a more favorable rate than they are. Like turnover margin, YPP is supposed to be pretty inconsistent from year to year, bouncing around with a team’s luck at picking up key first downs and converting red zone chances, along with the all-important knack for “bending but not breaking” on defense. Yet the Pats dominate this category so thoroughly and so consistently, it might be the single biggest factor in their ongoing success. Not only had they ranked first in both offensive and defensive YPP since 2010, but their net YPP differential of +5.6 was more than double the No. 2 Packers’ +2.5 mark over that span. This season, the Pats remain among the top net YPP teams, ranking fourth, but they are not quite dominating like usual. They rank just seventh in offensive YPP and sixth on defense, with a net YPP of +2.8, which trails the Bears, Saints and Chiefs. On top of the increase in turnovers per game from above, New England’s efficiency rankings on third down and in the red zone are worse, and the team has slipped in those same “situational” categories on defense. And if you want another cause for the Patriots’ YPP decline, their net starting field position is -2.6 yards per drive this season (meaning the opponent starts 2.6 yards closer to the end zone than the Pats), after a decade in which that number was a league-best +4.6. In other words, many of the little things that usually add up to that massive YPP advantage for New England aren’t quite working as well so far this year. But the good news for the Pats is that their turnover margin and net YPP tend to improve radically from this point in the season onward, in no small part because Belichick specifically tries to build a tough, physical team that thrives in bad weather. So even in a relative down season by their key indicators, don’t be surprised if the Patriots build them up at least some before season’s end. Tight end Rob Gronkowski has long been the Pats’ not-so-secret weapon on offense, helping the team transition seamlessly from the powerful Randy Moss-Wes Welker offense of a previous era to the version that’s been terrorizing the league for most of this decade. But the famously fragile Gronk has appeared to show his age and mileage this season more than perhaps ever before. He’s missed three games with various ailments, and when he has played, he’s been limited to just 63.0 yards per game with a career-low 0.25 touchdown catches per contest. Gronkowski’s reduced mobility has hurt his trademark ability to rumble after the catch for spectacular gains, and it’s made him much less of a focal point in the offense than he’s accustomed to being. When on the field, Gronk has seen only 18.7 percent of the targets in the Pats’ passing game, his lowest number since getting 17.7 percent as a rookie. But Gronk’s influence on the Patriots’ offense remains undeniable. In the eight games the star tight end has played in 2018, Brady’s passer rating is 98.2; in the three he missed, it dropped to 91.6 (league average is 94.9). Even with Gronkowski playing in a more limited physical condition than usual, producing less of a statistical footprint than before, this is confirmation that he’s still one of the biggest engines driving the Patriots’ success. The biggest question might simply be what kind of durability Gronkowski’s banged-up body will have over the rest of the season. Along with Belichick, the one constant in New England’s dynasty has been No. 12 under center. Brady has probably been the single most valuable player in the NFL this century, and he’s been crucial in engineering five Super Bowl titles for the Patriots with his consistency, leadership and ability to rally the team back from seemingly insurmountable deficits. But at 41 — an age at which almost no other QB has ever been productive — there is a near-constant watch for any sign of slippage in Brady’s performance. And he has been a bit less sharp statistically than in years past. His adjusted net yards per attempt index at Pro-Football-Reference.com, which measures passing efficiency relative to the league (where 100 is average), is 111 this year, down from 117 last season and 138 the year before that. It hadn’t been so low since Brady was barely above average (102) in 2013. Of course, there are reasons for Brady’s decline that go beyond his advanced age, from Gronk’s aforementioned absences to a four-game suspension for top target Julian Edelman at the start of the season and a WR corps in flux early on before adding Josh Gordon and shuffling roles for the likes of Phillip Dorsett and (WR-turned-RB) Cordarrelle Patterson. But Brady has managed to work around weird receiving situations before — and, in fact, his passer rating was better over the season’s first four games (94.0) than it’s been over the four most recent ones (90.8). Game quality is the harmonic mean of the Elo ratings for the two teams in a given matchup. While the game has a lot more at stake for Minnesota, whose spot in the playoffs is still not fully locked in, there is still plenty for the Patriots to play for as well. Not only will this game affect seeding for the postseason (Elo says the Pats currently have a 60 percent chance of securing a first-round playoff bye), but it will also be another telling data point as to whether the Pats can get back to their mega-dominant form of the recent past, or if they’ll be merely good — but mortal — according to their signature metrics. If you want to know where your team stands, FiveThirtyEight’s Elo ratings are a good indicator. You can check them out in our NFL prediction interactive, which simulates the rest of the season 100,000 times and tracks how often each team should make the playoffs and win the Super Bowl. Did you know you can also pick against the Elo algorithm in our prediction game? Try it out, and maybe you can climb up our giant leaderboard. On average, Elo beat our readers by 18.9 points in the game last week, bringing its record to 11 wins and one loss so far this season. Readers had the best pick of Week 12 — rightly pumping the brakes on Cincinnati’s chances of beating the Browns — but they were punished for picking against Elo in the Bills’ upset over the Jaguars, and they didn’t show enough faith in the victorious Vikings, Eagles and Bucs. Among individual users who did better than average, congrats are in order to Ryan Gnizak, who led all users in Week 12 with 263.5 points, and to Greg Chili Van Hollebeke, who held on to a slim lead for the entire season with 934.5 points. Thanks to everyone who has been playing — and if you haven’t, be sure to get in on the action! You can make picks now and still try your luck against Elo, even if you haven’t played yet. Conventional NFL wisdom says teams should do whatever it takes to snag a Franchise Quarterback — that from there, the winning just takes care of itself. But for most of Philip Rivers’s career, his Los Angeles (née San Diego) Chargers have been the exception to that rule. Taken fourth overall in the 2004 draft, Rivers has been the elite passer that teams dream about building around. And yet, his team has just four total playoff wins to show for it, including only one this decade. This year, though, Los Angeles looks poised to reverse that trend and actually capitalize on having a future Hall of Fame QB in its midst, while there’s still time left in Rivers’s career to do it. The Chargers walloped the Browns 38-14 in Cleveland last Sunday, bringing their record to 4-2 on the season — and giving them a 61 percent probability of making their first playoff appearance since 2013. Although L.A.’s postseason bid is far from assured, right now the Chargers have set themselves up with their most promising start to a season in a long time. This Charger renaissance has been building for a few years, since the team finally began surrounding Rivers again with better playmakers on both sides of the ball. On defense, that goes back to 2012, when former general manager A.J. Smith drafted pass-rusher Melvin Ingram 18th overall. After a slow start to his career, Ingram has blossomed into a Pro Bowler and an annual double-digit sack candidate. Under Smith’s successor, Tom Telesco, the Chargers have also grabbed several defensive contributors through the draft, including sack-machine DE Joey Bosa,17 solid LB Denzel Perryman, up-and-coming CB Desmond King II and rookie S Derwin James (who, in his first season, already ranks as the NFL’s fifth-best safety according to ProFootballFocus’s player grades). Toss in outside pickups such as DT Brandon Mebane and CB Casey Hayward — another Pro Bowler from last season — plus the guidance of proven coordinator Gus Bradley, and the Chargers’ defensive talent base has undeniably made strides over the past handful of seasons. On offense, Telesco also made key acquisitions that helped pave the way for this year’s hot start when he took WR Keenan Allen in the third round of the 2013 draft and RB Melvin Gordon 15th overall in 2015. Picking first-round running backs is always tricky business, but Gordon has been a good one so far in his career, with a couple of 1,400-yards-from-scrimmage seasons under his belt (in 2016 and 2017) and an excellent start to 2018 as well. Meanwhile, Allen has taken the lead from top San Diego-era targets Malcom Floyd and Antonio Gates and forged his own chemistry with Rivers — only four receivers leaguewide have more yards through the air since 2017 than Allen does. (It also helps that Allen has stayed healthy these past two seasons after missing 23 combined games in 2015-16.) Allen and Gordon aren’t the only teammates making Rivers’s life easier: The offensive line has been much better with free-agent C Mike Pouncey anchoring the middle, while change-of-pace RB Austin Ekeler has proven himself exceptionally tough to bring down — he leads all RBs in yards after first contact per rush. More broadly, in its second year under head coach Anthony Lynn, Los Angeles now has the offensive pieces to beat teams in multiple ways. Per-game measures are relative to team schedule lengths, not individual games played. YABQ: Yards Above Backup Quarterback, a measure of QB performance that gives credit for passing and rushing, and adjusts for strength of schedule. YDSC: yards from scrimmage, or rushing yards plus receiving yards. Defensive efficiency: ESPN’s measure of a defense’s per-play effectiveness on a 0-100 scale. It probably isn’t a coincidence that Rivers is currently enjoying his best statistical performance in years, with Gordon and Allen also contributing more than any Charger rusher and receiver since the days of LaDainian Tomlinson and Vincent Jackson. It’s a little circular, in that sense: Is Rivers making them better, or are they helping Rivers rediscover his form? (Gordon’s ability to run against stacked defenses, for instance, has opened up space for Rivers to throw downfield.) Either way, the ingredients have been in place for a late-career QB rejuvenation. Right now, Rivers is on pace to tie for the ninth-most-efficient post-merger performance for a passer age 35 or older, according to Pro-Football-Reference.com’s advanced passing index. As far as old-man QB seasons go, this is one of the best in history. Of course, with the Chargers, it’s about more than just improved talent. It’s also about execution, something this team has often been found sorely lacking over the years. As Mike Tanier wrote in his L.A. chapter for Football Outsiders’ 2018 Almanac, you could make a pretty convincing case that the 2017 Chargers missed the playoffs because of two very fundamental football activities: tackling and kicking. Last year, Los Angeles let opponents break tackles at an incredible rate and missed numerous field goals and extra points, helping to turn a team with 10-and-a-half-win point differential into a sad-sack nine-game-winner. This year’s place-kicking game hasn’t been great (Caleb Sturgis made just 71 percent of his total field goals and extra points before he was sidelined by an injury), but it’s no longer dead-last in football, which I suppose is an accomplishment. Plus, the Chargers rank among the best in the league in terms of kickoffs, a big reason for their fourth-ranked net starting field position. And as for the tackling woes, they appear to be a thing of the past. According to Football Outsiders’ charting data, only 3.9 percent of plays by Charger opponents have seen a broken tackle, good for 10th best in the league this year. Relatedly, the Chargers are also allowing the league’s sixth-lowest rate of yards after first contact per rush this season, another major sign of defensive progress as compared with last season. For the Chargers, it’s part of a long road trip that will keep them away from Southern California until Nov. 18. The StubHub Center doesn’t exactly offer an intimidating advantage even when they are at home, but it does bear watching how L.A. manages all that travel. Even so, the Chargers’ season will still probably hinge on the final few matchups of the season — their last five games are either against division rivals or the biggest threats to their wild-card chances. If Rivers and his improved supporting cast can continue to thrive up to and including the month of December, we’ll know the Chargers have stamped their ticket back to the postseason and given their star QB at least one more chance to shine on the game’s brightest stage. Attention football fans! Be sure to check out our constantly updating NFL prediction interactive, which uses FiveThirtyEight’s Elo ratings to forecast the rest of the season. And if you think you can outsmart Elo, step right up to our prediction game, which lets you pick against our model (and your fellow readers) for bragging rights and a place on our giant leaderboard. What’s been a great season for Elo kept getting better in Week 6 as the algorithm beat the average reader by 55 points, its second-best showing of the entire year so far. Human predictors really only had one major feather in their cap — Houston’s Nathan Peterman-fueled win over Buffalo (a very bad team whose badness Elo refuses to acknowledge) — but otherwise they saw Elo run roughshod over their picks. Elo correctly called wins for Dallas and Miami when readers picked otherwise, and it had a lot more confidence than readers in the Jets’ and Chargers’ victories as well. All told, the average reader is now down 233 points to Elo for the season to date. Among the readers who weren’t destroyed by Elo, congrats to John D. Harden, who led all users with 275 points in Week 6, and to Jevon Mallett, who continues to lead all users for the season with 453 points. Thanks to everyone who played last week — and if you didn’t play, get in on the game already! You can make picks now and still try your luck against Elo, even if you haven’t played yet. When Dak Prescott’s improbable pocket escape and 44-yard heave set up a field goal to tie Sunday night’s Cowboys-Texans game late in regulation, viewers were left with a familiar feeling: This game, like so many others this season, seemed destined for overtime. (Indeed, it did require OT — the Texans kicked a field goal in the extra frame to win 19-16.) It was the eighth overtime game of the 2018 season already — the most in the first five weeks of any NFL season since 2002, which also saw eight OT games. Along the way we’ve also gotten two ties, ensuring only the league’s fourth multi-tie campaign since it first introduced regular-season OT in 1974, and we narrowly missed three others thanks to game-ending scores in the waning seconds of the extra period.14 While the NFL still faces plenty of big-picture problems — and some fans are even lamenting the renewed prevalence of those dreaded ties — this wave of close finishes has mainly made last year’s complaints about boring football seem like a distant memory. The spike in overtime contests is just one element of this year’s extra drama. According to ESPN’s Stats & Information Group, 52 of the league’s 78 games this season have seen the trailing team sit within one score of the leader with five minutes left in the game — the second-most in any season through five weeks since 2001.15 Furthermore, 47 games this season have been within a score with two minutes left to play in regulation. It’s a perfect recipe for wild endings like Sunday’s Panthers-Giants duel — which saw two lead changes in the final 68 seconds of play — or last week’s Raiders-Browns thriller, with its four separate game-tying or go-ahead scores in the fourth quarter and OT alone. Anyway, all of this mainly speaks to the rise in parity across the league as a whole this year. Through five weeks, the Kansas City Chiefs rank No. 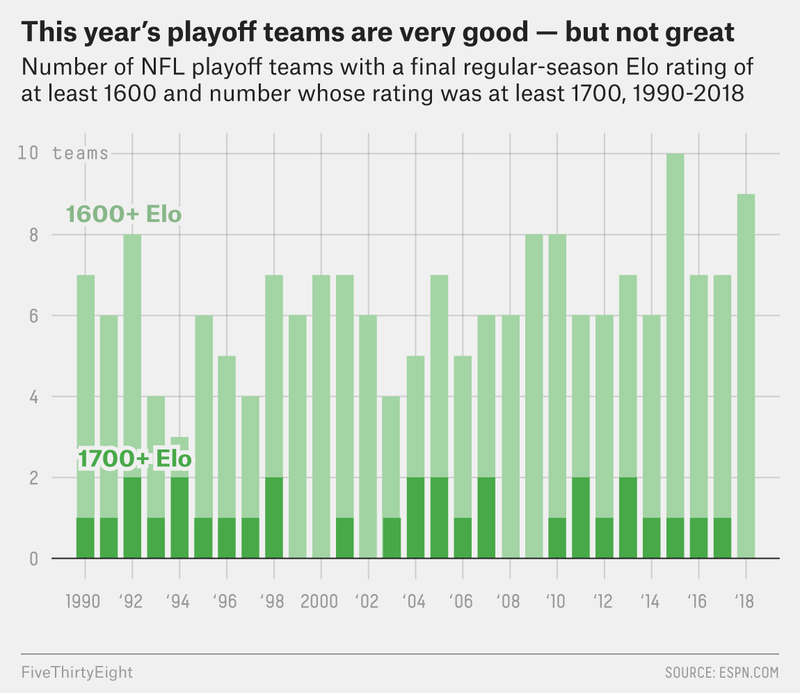 1 in FiveThirtyEight’s Elo ratings (our pet way of gauging how well a team is playing at any given moment in time), though their 1657 Elo isn’t especially high for an NFL leader at this stage of the season.17 At the other end of the rankings, the No. 32 Cleveland Browns (1344 Elo) are a lot better than the typical last-place team. You might say the Browns deserve better than 32nd place (I happen to agree), but choose an alternative — the Bills? Cardinals? Giants?? — and each has at least shown some signs of basic competency at various times this season. All of which is to say: The gap between the best and worst teams is not as wide as we’ve gotten used to it being. Unlike college football, which is currently as imbalanced as ever, the pros have generally tended toward more competitive balance since the 1970s. That trend, though, largely leveled off once free agency and the introduction of a salary cap equalized each team’s spending, creating a parity machine that apparently only the New England Patriots — and conversely, until this year at least, the Browns — could resist. But even against that backdrop, this year’s Super Bowl race looks particularly wide open, with K.C. sitting nervously as tentative favorites. Of course, the Chiefs have tempted us to overreact after beating the Patriots before, so maybe we won’t actually learn as much as we might hope on Sunday. But Week 6 also offers a number of matchups that could move the playoff-odds needle by at least 20 combined percentage points — including Cincinnati vs. Pittsburgh, Baltimore vs. Tennessee and Carolina vs. Washington. Out of all these tightly contested games, surely some will flirt with overtime (or maybe even a tie!) again. But more than just giving us yet another chance to jokingly compare stalemates on the gridiron with those on the soccer pitch, it’s a real sign of how evenly balanced the league has become so far this season. Want another way to keep up with the league? Be sure to check out our constantly updating NFL prediction interactive, which uses Elo ratings to forecast the rest of the season. And if you think you’re smarter than Elo, now you can prove it: In our prediction game, you can pick against our model (and your fellow readers) for bragging rights and a place on our giant leaderboard. Elo eked out another victorious week over the readers, winning by 24.3 net points on average. 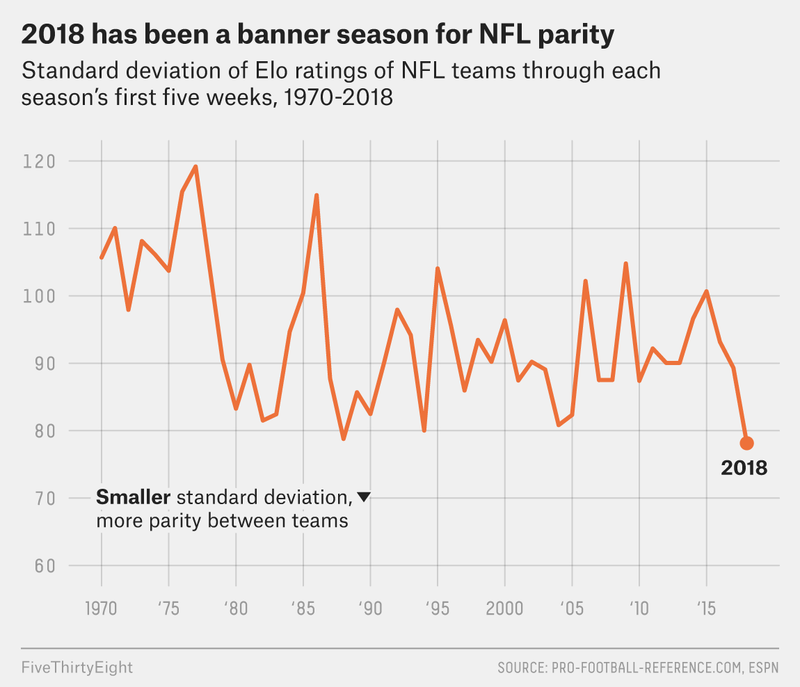 It’s been an unusually impressive start to the season for Elo, whose built-in lack of knowledge over the NFL’s offseason comings and goings hasn’t seemed to hamper it one bit. (Maybe this is a nice reminder that preseason NFL predictions are mostly useless.) In Week 5, Elo was too high on the Seahawks, Eagles and Ravens, all of whom fell short. But it made up for those bad picks by calling Buffalo’s win over Tennessee and Detroit’s victory over Green Bay, among other games. But Elo didn’t make all of our readers look silly. Congrats to reader Paul Diaz, who led all users in points for Week 5, and to Jevon Mallett, who leads all users on the season in total. Thanks to everyone who played last week — and if you didn’t play, get in on the game already! You can make picks now and still try your luck against Elo, even if you missed the first quarter of the season.